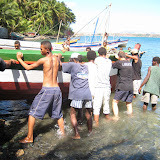 Jean has finished building his latest boat named Miaraka (Malagasy for ‘to be together’ or ‘to go together’) . It’s a traditional wooden boat that can use sail or outboard motor (up to 40hp). It was constructed using methods passed down from older fishermen in his district (follow links to see photos of La Dordogne, Antsiranana). 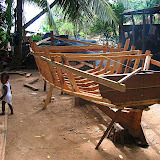 See all Traditional wooden boat building photos. He built his first boat when he was 23 years old. 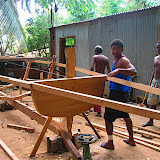 He used to do it all by hand but now has many power tools that kind people (usually friends from Reunion island) have given him. 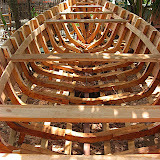 It takes about 3 months to build a boat. If you could guarantee having all the parts at your fingertips when you wanted them you could push it down to 2 months at a push. Jean does more than half the work himself working mainly with one assistant (Big Meo – not very big actually but it’s to differentiate him from Little Meo who also works with Jean quite often). He then calls on others from the area to help with odd tasks. Jean sold his previous boat in August which just gave himself enough time to build a new one before the next fishing season. As soon as the wind dropped – he was out at sea. It’s form is in between the V and U shapes mentioned above. Jean built two boats in 2006; one for himself and one for sale. Their lenghts were 7.20m and 8.00m respectively. The 2005 boat was 7.20m.